Modifying Traditional Formula is necessary in many cases if they are to be used in modern times. But modifying without losing the ‘essence’ of the Formula is imperative. Here we will discuss some of the principles of modifying a Traditional Formula. All Traditional Medical systems have great formulas written by Masters who are unparalleled in modern times. Sources such as Charaka of Ayurveda, Galen of the Greeks, Mesue of the Unani system and the Shang Han Lun of China contain truly remarkable formula which have been used continuously for many centuries. These seminal sources were so important because they were written by masters who were truly connected to nature and had an understanding unlike any modern practitioner. I believe this is because in older times things were quieter and life was simpler, the mind was more still, people were more open to sensing nature in a way that is very difficult for modern man. In ancient times, people were able to ‘listen’ to nature. They connected with it in such a way that they knew how to work with nature. Modern man constantly strives to work against nature, and to control nature. That is why the ancient sciences of magic, alchemy and medicine sometimes achieved things seemingly impossible in modern times. Modern herbalists tend to write simple formulas which tend to be minimalistic, containing a small handful of medicines. If a person presents with a given condition, several herbs appropriate to that condition are combined. At its extreme are some Phyto-therapists who prefer standardised extracts of single herbs in their treatment. Traditional Formulas written by the Masters tend to be elegant in their design, and potent in their effect. They are more holistic in that they often treat both the symptoms and the underlying condition. And as stated above, a delicate hierarchy is formed by the interplay of the different medicines; thus there may be assistants, guiding medicine, harmonising medicines and correctives, all with effects different from the lead herb and different from the primary intention of the formula. Thus, a given formula for a specific use may contain medicines not specifically useful for the intention, and yet the effect is more profound. Modern herbalists tend to apply medicines that have proven effect without an understanding of the energetics of a medicine. A treatment for Asthma may combine several medicines shown to be effective for Asthma, rather than focusing on underlying causes such as weak digestion, excess Phlegm, or Lung deficiency. In addition, traditional formulas tend to be ‘corrected’; that is, formulas that contain harsh or irritant medicines are combined with medicines that harmonise and eliminate unwanted effects. In addition, harmonisation tends to make them more palatable, and therefore, more agreeable. There is a reason that over the centuries, certain formulas stayed in widespread use. There is a reason that the formulas of certain authors became highly respected and followed over not only centuries, but spanning many countries and regions. The fact Ayurveda, TCM, Unani and Tibetan Medicine all still use formulas that are many centuries old suggests Western Practitioners should also tap into their own vast resource of Traditional, time-tested formulas. Traditional texts often used one name for a number of medicines, and this seems common to all traditions. For example, a number of medicines have supplied Cardamon. Indeed, with a number of medicines, the actual sources are varied and complex. Costus has a number of different plants which have supplied the market, and still do in TCM today. It should be realised also that many traditional formula had a large number of variations. Mesue often had a number of formulas that went by the same name, with slight variations. In addition, Physicians would create their own version of a formula inspired by the original, and often calling it by the same name. This implying that their ‘reformed’ version was as effective and was intended for use as the original. Mesue was a contemporary of Avicenna, and Nicholas followed them. These authors often were inspired by one-another and composed formulas similar to one another, sometimes even calling them by the same name. So it can be seen that modification of a formula is far from new, and has been applied in all medical systems over a considerable period of time. Can a modified Formula be used effectively? In most cases, modifications can be made without great loss or detriment. In some cases, a larger dose may be needed. It must be realised that even the originators of the formula often had a number of variations they used. Also, in some instances there are formula families; that is, a number of related formula with additions or minor changes. Often the main modification of a formula may be the removal of obsolete substances such as Musk or Ivory. In such cases, the remaining formula is usually still much better than a formula written by a modern practitioner. So there is rarely a case where a formula must be followed exactly according to formula. The simplest modification can be to simply change the doses of some or all of the medicines, or else change their relative proportions. This can change the basis of the formula, and in some cases, can swap the role of King with a Minister or even an Assistant. It can also change the bias of a formula. Often a formula may contain an obsolete or unobtainable medicine. When that medicine forms a small part of the formula, the medicine can often be eliminated without any great detriment. In many cases a formula will stand without a medicine, sometimes without several medicines. Many of the Greek and Arab formulas would use several medicines with similar effects; for example the ‘Cold Seeds’ or ‘Opening Roots’. In such cases, if one of the medicines was unavailable, it may be omitted and a double quantity of another one of the medicines used without detriment. Sometimes adding a medicine can dramatically change a medicine. In some instances a specific formula is required, but due to a secondary condition, another herb, pair, or unit might be required. As an example, Cooling Tragacanth Powder (Diatragacanth Frigidum) is altered by having twice its weight of Orris root added. This then becomes strong to relieve Cold Phlegm, rather than nourishing Yin. Substituting medicines has long been practiced. Traditional medical texts regularly supply a list of substitute medicines to allow a formula to be made if one or several ingredients were not obtainable. It should be realised that some medicines commonly available today were often not available, or may have been too expensive at certain times in history. Even medicines like Pepper and Cardamon fall into this category at certain times in history. Certain substitutes have become commonplace. For example, Safflower is regularly used for Saffron in TCM, Tibetan and Unani medicines. Likewise Mother-of-Pearl is commonly taken for Pearl, Water Buffalo-horn for Rhinoceros horn and man-made Musk and Bezoar for the genuine articles. In many cases, traditional formulas contained a number of medicines, often with similar properties. For example, it was common to have a number of the warm seeds of the Apiaceae in one formula. In such cases, the seed most applicable to the intended use may replace some or all of the other seeds with a proportional increase in dose. Often a medicine that was originally designed in one form can be made in another. For example, a syrup may be made as a tincture, or an electuary, as a powder. This is commonly practiced in modern times, where a formula traditionally used in the form of a decoction is made into pills, for example. One of the main concerns for many practitioners is the unavailability of some of the medicines used in Traditional formulas. In addition, some medicines are harsh or poison, and are therefore either illegal, or not to be used by inexperienced practitioners. The answer is simple: in many cases, it doesn’t matter. In cases where a formula contains a number of medicines, and also includes medicines like Musk, Ambergris, or Castoreum, these medicines are usually used as ‘potentisers’; that means, to enhance the effects of the other herbs in the formula. In some cases, they can be omitted; in other cases other medicines such as Saffron, Calamus, Storax or Camphor may be used in their place. In formulas where harsh purgative medicines are used, they are often combined with softer purgative medicines like Senna and Rhubarb. Therefore, these formulas will still work as purgatives without the harsh medicines, but just work more slowly and gently. In formulas where unobtainable medicines are used, there are usually acceptable substitutes which can be found in the list of Substitutes. Some of the classical formula are excessively large, complicated, and contain hard-to-obtain or unobtainable medicines. In these cases, the formula should be simplified. For example, often a large formula may contain a number of medicines which are closely related with similar effects. The seeds of the Apiaceae are good examples. It is not uncommon to find formulas which have the seeds of Fennel, Parsley, Celery, Cumin and Anise, either some of these, or all of them. In such cases where a formula is wished to be simplified, one or two of these which are most applicable can be chosen without detriment to the formula. Many classical formula may be based on only one or several key herbs, with the remainder of the formula being adjunct medicines to enhance efficacy, increase digestion or promote circulation. In such cases, the primary medicines can be taken along with just a few adjunct medicines, thereby simplifying a large and complex formula. It should be noted that even in the 17th and 18th century, radical reformations of classical formula were made, sometimes culling formulas with over 20 medicines to just a fraction of the original formula. These were often referred to as ‘reformed’, and would be used just as the classical medicine which they emulate. The ancient classical formulas Theriac and Mithridate which contained dozens of medicines were slowly reduced and simplified over the centuries. Unobtainable medicines were replaced with herbs available at the time; medicines which were similar to other medicines within the formula were eliminated to reduce the number, and in some cases new medicines which were deemed applicable to their intention were added. Numerous variations of these large compounds can be found in dispensatories spanning centuries. All the active Traditional Medicine systems (Unani, Ayurveda, Tibetan Medicine and TCM) have successfully taken Traditional formula and modified them for modern times. Medicines such as Musk, Ivory, Rhino horn and Bear bile are contained in numerous Traditional formulas and in a number of cases they are available in modified form with substitutes, modifications or synthetic replacements. Safflower regularly replaces Saffron in modern formula to make them more affordable. Synthetic Musk and Bezoar replace the natural. Mother of Pearl often replaces Pearl. Large amounts of Gold are reduced to a ‘token’ amount, or eliminated altogether. As stated elsewhere, many Tibetan formulas have had to be re-written when Tibetan physicians moved to India or Russia. In these cases, local substitutes for herbs only available in Tibet have been found and replace the now unobtainable medicine. There are a number of TCM patent medicines which use synthetic Bezoar in place of natural Bezoar. One example is Niu Huang Jie Du Pian. This is widely available by a number of manufacturers and the use of man-made Bezoar makes this effective and far more affordable. This is only one of a number of examples throughout the various Traditional medicine systems. Another example, still commonly used in the West is Swedish Bitters. The original formula contained Venetian Theriac; a large and complex formula containing numerous obscure medicines. This has been reduced to just a few medicines in modern times so the formula is able to be used in modern times. Traditional formulas are therefore guides for inspiration, not set formula to be rigidly adhered to. They should be studied and understood to enable the modern practitioner to be able to formulate their own formulas based on traditional principles. 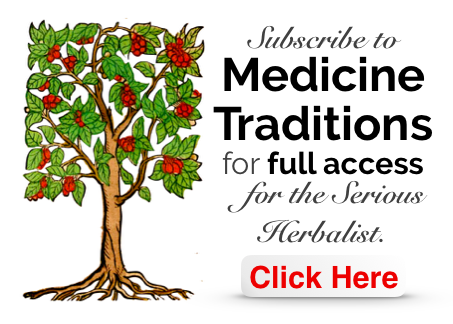 To not study Traditional formula is to not be a true herbalist. These clearly demonstrate that Traditional formulas can be used in modern times, with modification. In the above modified examples, there are a number of substitutes making it easier to prepare. For example, Valerian instead of Indian Spikenard, the use of Cinnamon, Galangal and Myrrh in place of Balsam fruit and Mastic, and in the modern Unani version, a significant reduction in the dose of Saffron. Using these examples as prompts, a version can be readily created today. This is included because of a fairly drastic 'culling' of medicines by a respected author, mid 18th century. Often drastic reductions of traditional formula were executed mid–late 19th century (100 years later). Removing the Cold Seeds and Sugar Penids makes this formula far easier to recreate today. Tragacanth is a wonderful medicine, rich in polysaccharides with tonic properties. This reformed version is a simple method of using it which could be made even more simple with the combination of just Tragacanth and Licorice.